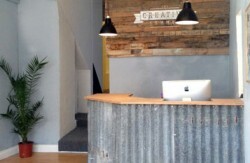 Coffee, Cowork and Collaborate at indycube Haverfordwest! You'll find us in the Creative Common Coffee House, hidden away on Goat Street. There's free car parking situated at Haverfordwest library and limited on street parking if you're just popping in. If you prefer public transport, we're a 15 minute walk away from the train station. Indycube Haverfordwest is open 8am - 6pm Monday to Friday.